Yay, it arrived. I ordered the new Messy Mansion pro boxed set of 10 stamper heads the weekend they were released. Sadly Australia Post have been so slow in delivering this to me, especially as Messy Mansion HQ is less than an hour from my place! But it's here now, and I'm excited to show you the new stamps. The Pro Set comes in a small tin and includes 10 customs stamping heads, a standard XL double sided stamper with two plastic scrapers and a magic eraser sponge block. Each stamping head comes in its clear plastic manufacturing mold, which is fantastic as it ensures they don't get squished out of shape during shipping. It also protects them from dust and hair and anything else that might damage the silicone (especially the marshmallow squishy and sticky ones). To get the stampers out of the plastic, you gently pull the edges in releasing the seal on the plastic, you can then slightly squish and roll each one out. I'm going to continue to store each stamper in it's plastic housing for safe keeping when not in use. 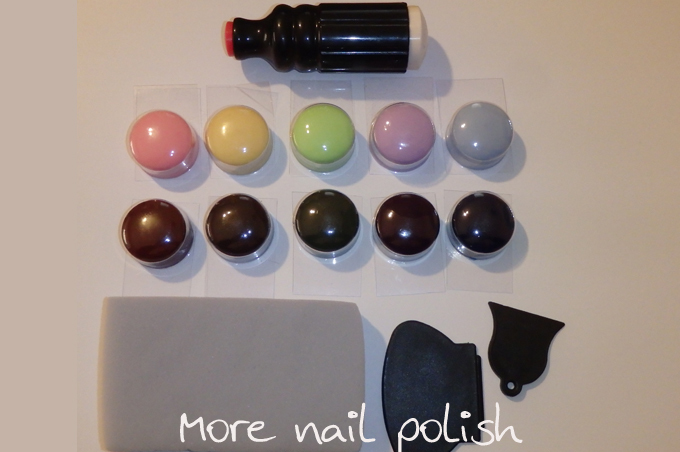 The ten stampers come in five different softnesses, with each softness provided in a light coloured stamper and a dark coloured stamper (you use the different colours so you can see a contrast of the polish on the stamper eg dark polish on the light stamper and light polishes on the dark stamper). Descriptions such as soft, medium and firm are hard to interpret, because something I say is medium might be soft to someone else, so let me really show you the squishiness of some of these. Please remember that the light a dark colours in a set are the same squishiness, so where you see a photo of one, know that its pair coloured stamper is the same softness. First up is the soft pink/maroon ones. Here I have a squash comparison with my original soft and squishy XL stamping head. The old stamper is actually unusable now, the silicone has started to break down and the surface is pitted (I stupidly used acetone on it instead of cleaning it with sticky tape), but it's still the softest marshmallow stamping head I have. The pink and maroon heads are nice and squishy and a little sticky. Not as sticky as the white one, but that might be an age thing. The pink/maroon heads are not quite a squishy as the white one, it's only marginal but I could feel a difference in a hard squish test like this. Here is the difference between the soft and the medium soft stampers. Both are slightly sticky and the squishiness is quite similar. The pink/maroon ones are just that little bit softer than the yellow/brown ones. It felt like about the same difference as between the pink and the original marshmallow above. Here is a comparison between the softest pink/maroon heads and the firmest blue/navy heads. I also compared the blue heads with the new white head that arrived in the XL stamper in the tin. The blue was just a shade softer than it. Here is another squish test on the soft, medium soft and medium stamper heads. And one last comparative squish test, this time squashing the stamper sideways. All these were squeezed together with firm pressure as consistently as possible. As a final summary to squishiness, I rated all my stampers in a squish test. I did a one on one comparison through all my stamping heads to come up with the following list. OK, enough on squishiness, lets move onto size to find out if size matters? ... and the tiniest bit larger in circumference. For me, this slight size increase is awesome!! One thing that really drove me bonkers with the original marshmallow stamper was that it kept falling out of the holder, either sticking to the plate or to my nail. These ones fit snugly into the XL stamper and don't fall out. Of course it doesn't really matter how squishy or firm a stamper is if it doesn't actually stamp, right! I did a quick test of each firmness to see how they went. These quick stamping tests were done using Mundo de Unas black stamping polish and a Moyou London plate. I used each stamper directly out of it's plastic housing without any priming. The set comes with a magic eraser block that you can use to prime your stamper if you have any problems with it picking up, but I didn't find I need to prime these at all. I'm sure there will be people out there wondering what you need 10 stamping heads for, and to those people I answer with, 'I need 10 stamping heads like I need 2000 polishes', or "I need 10 stamping heads like I need 20 silver holographic polishes', or 'I need 10 stamping heads because I just need 10 stamping heads'. So you get the idea right. 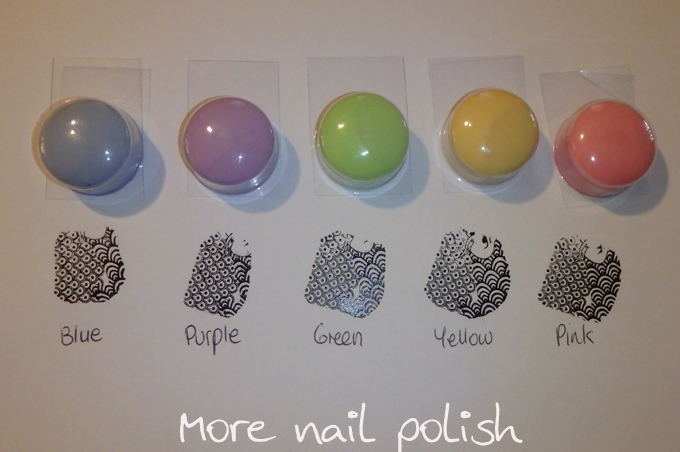 In all seriousness though, I will use the mostly for stamping decals and reverse stamping. 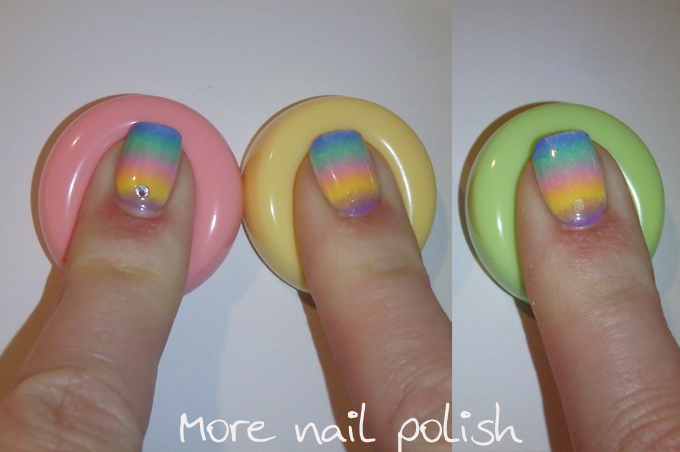 Having multiple stampers means I can do more nails in decals and it reduces the time frames for do it. Plus imagine the stamping parties I can have with my friends now! The 10 Stamper Head Pro set is currently sold out, but I know Julia has heaps of stock, so there will be more listed. Each pair of of stamper heads is also sold individually, either with a tin or without. At the moment they are only for sale from the 'old' Messy Mansion website, items sold on this site are shipped from Australia. There is stock already on it's way to the USA and when it gets there, they will be sold through the 'new' Messy Mansion website as well as through Amazon - I think this could be as soon as next week. I know there are lots of people looking for squishy stampers, so I hope you found this post useful. P.S. 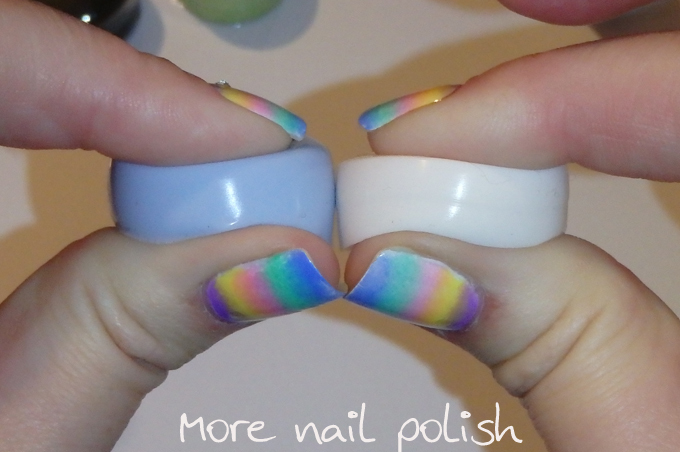 Can you believe that I happened to still have on a multicoloured gradient that matched the stamper head colours (third day running on this mani so it was looking a bit beaten up) It was like it was meant to be that they arrived today! Thank you Cathy. Awesome article. I thought the purple replacement head is the same squishness with the firmest blue, but good to know that the blue is a bit softer! Great idea of have them on different levels of firmness! Excellent review! 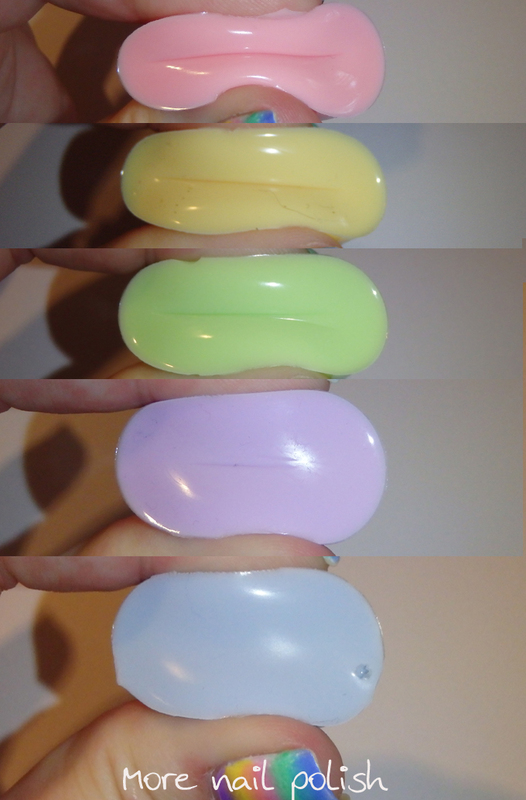 I never was able to get the softest marshmallow stamper from Messy Mansion, but currently the softest one I own from Winstonia and it extremely sticky and very soft so it will be interesting to compare. P.S. 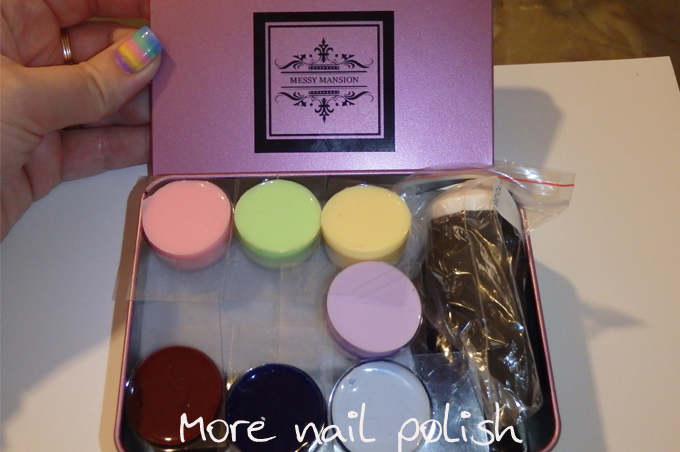 It's so strange that so many women have had problems with their stampers from using acetone on them. 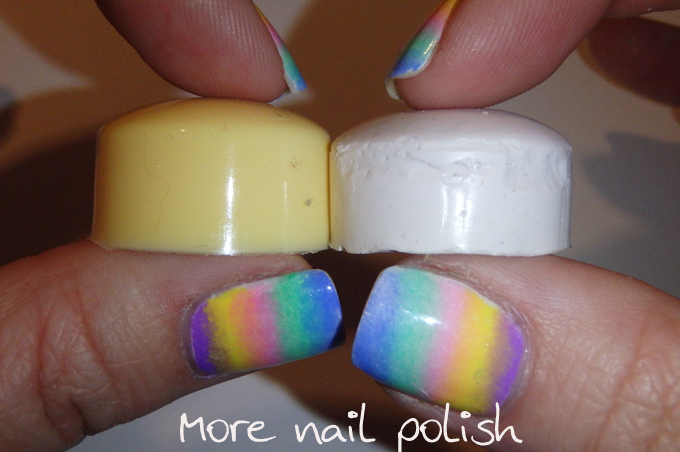 I have my original marshmallow stamper and Winstonia stamper that I have used acetone on for over 3 years consistently and haven't had any problem with breakdown. I did recently switch to other methods just in case but I'm really surprised! I too will be ordering the 10 head tin though in all honesty I now have more marshmallow stampers than what is probably sane! Loll again great review hun! 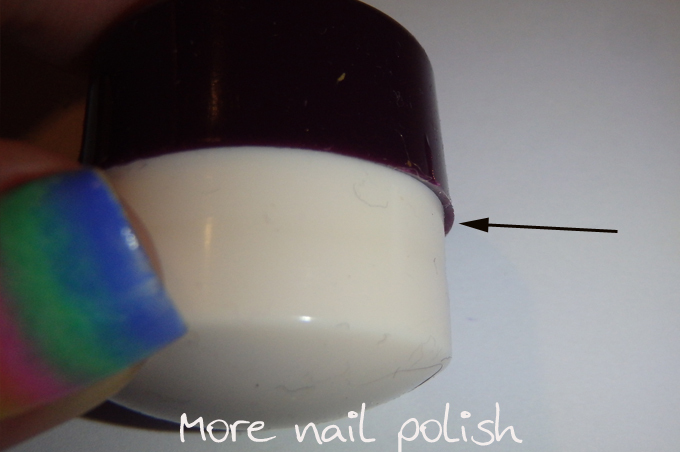 I had always used acetone too, but it was only the marshmallow squishy where the sides started to peel off, and now it has lots of tiny holes on the surface too. I was using 100% acetone, is that what you were using? I thought they created 10 so you could experiment with the different squishiness and find the one u like best. Plus the whole multiple decal thing. Thanks for testing them. 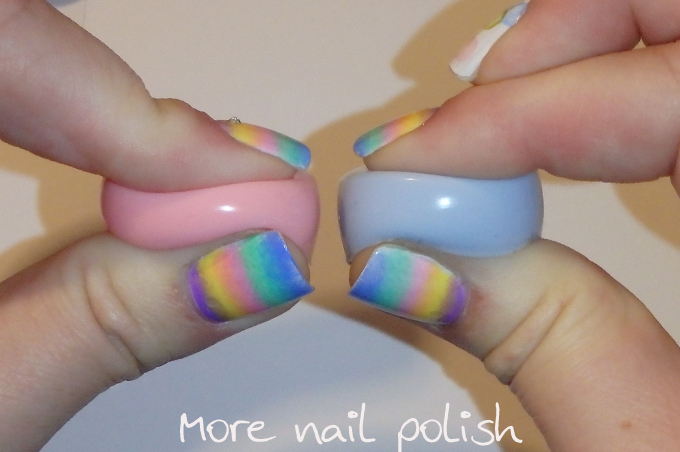 I totally love this review I've been searching high and low for a squishy stamper! Can't wait to order and review for my website!! OMG what an amazing post!! thank you SO much for doing all this! 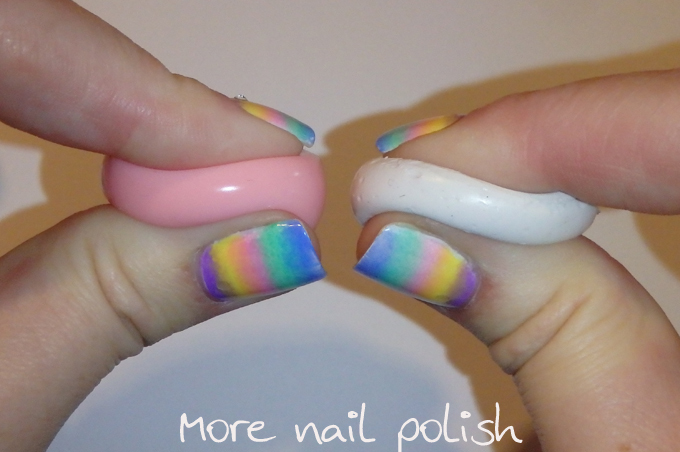 I found this post through the weekly favorites post of lustrous laquer! Thank you so much for sharing this article with us!